It’s no secret that tattoos hurt. The key is to understand the science behind inking. Here’s a tattoo pain chart explaining the science of tattoo pain. Americans spend over $1.6 billion each year on tattoos. That’s a pretty astounding figure considering most people, in general, don’t like pain yet are perfectly willing to put up with the pain of the tattoo needle. Yes, tattoos hurt, no matter what location of the body you get one on. However, some areas are more sensitive than others. If you’ve been thinking about getting inked but are apprehensive about the pain involved, have no fear. Our handy tattoo pain chart will show you exactly how much discomfort you can expect depending upon the body part. We’ll also discuss why tattoos are painful and what you can do to prepare yourself for one. To understand what makes tattoos painful, you have to understand a bit about your skin’s anatomy. Your skin is made up of several layers. The top visible layer is the epidermis. This is the layer that gives us our skin tone and contains skin cells that naturally slough off. Just below the epidermis is the dermis. This deeper layer contains sweat glands, blood vessels, and connective tissue. In order to create a tattoo, a tattoo artist must use a needle that gets inserted far enough into the deeper dermis layer of skin. The needle will rapidly be inserted into an area anywhere from 80 to 150 times per second to deposit ink there. Unfortunately, the dermis contains nerves and pain-sensitive receptor cells. Having a needle injected there will send signals to the brain that the area is basically being injured and you’re going to feel pain. If the sound of all this is already making you cringe, just know that some ancient civilizations would basically create tiny wounds in people’s skin and place unhygienic dyes into the area to create a tattoo. Today’s modern tattoo parlor has come a long way, offering sanitized equipment and safe dyes. Where you decide to have a tattoo placed can definitely have an impact on the level of pain you may experience. Of course, every person is different and has their own personal threshold for pain. But our tattoo pain chart will provide you some perspective. Your buttocks are actually one of the least sensitive body parts to get a tattoo, but a tat in this area is not for everyone. The inside of your forearm and your shoulder are also the least painful areas for tattoos. In fact, the discomfort felt while having a tattoo done in these areas has often been compared to an itch or pinpricks. That leaves the rest of the body including the head, neck, ribs, armpits, knees, ankles, and feet. These areas are notoriously painful and can be unbearable for some tattoo customers. Your tattoo artist may have to take breaks to let you catch your breath if you receive a design on any of these body parts. Also, any bony areas tend to bring on more pain because it can feel like the needle is repeatedly striking the bone. It isn’t uncommon for tattoo clients to actually pass out in the chair while receiving a tattoo in any of these ultra-sensitive areas. If you’re unsure about where to receive a tattoo, a tattoo artist can offer some advice and guidelines. 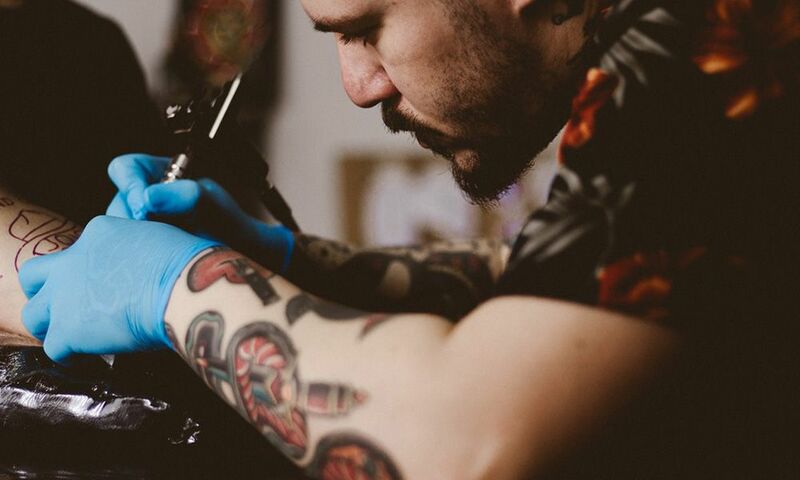 Now that you know more about what causes tattoo pain and what body parts you may want to shy away from, here’s some tips on how to minimize discomfort during your tattoo session. There’s actually quite a bit you should and shouldn’t do to help prepare your body for a more comfortable tattoo appointment. Here’s some general dos and donts to follow. Do Drink Plenty of Water: Keeping your body hydrated (with water, not alcohol or caffeinated beverages) can actually help the ink absorption. Don’t Drink Alcohol: It’s tempting to want to knock back a drink or two to help deal with the pain, but alcohol will act as a blood thinner, increasing the amount of bleeding. Don’t Take OTC Medications: Taking Tylenol, Aleve, or another over-the-counter pain reliever can thin the blood just like alcohol can. Instead, ask your tattoo artist if they offer any numbing spray that can help take away some of the sting as they do their work. Do Chat With the Artist to Help Distract You: Making friendly conversation with the tattoo artist can help keep your mind off of the pain. It also helps to approach the appointment with a positive mindset and psyche yourself up for it. Thanks to our tattoo pain chart and tips, you should now have a better idea of where to get a tattoo and what kind of pain you can expect. Are you feeling ready to get inked or receive a body piercing? Contact us to make an appointment. We’ll be happy to answer any questions you have about tattoos and discuss design ideas with you.